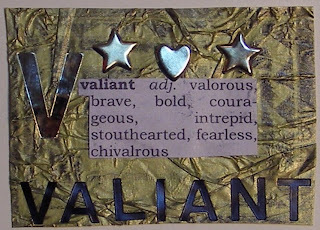 It occurs to me that the ability to be valiant on the outside requires that some stuff be present on the inside. The root of the word courageous is the French word for heart. We have to have love going on inside in order to be able to boldly go where our fears tell us to make a wide circle. I have just recently figured this out and I am still curiously inspecting it. You've heard the old adage that courage isn't the absence of fear, but rather feeling fear and going along anyway. Well the "going along" takes love. I was once told that as well as agony being a great motivator ("no pain, no gain") so is desire. I have done some things in my life that have broken all the rules and gotten me, miraculously I first thought, where I had wanted to be. But it isn't so much a miracle I'm thinking now. I knew where I wanted to be and the desire to be there was, in sum, far, far: tons stronger than all the circling voices in my head telling me to "Watch out!" I am doing it again: walking towards something that I love wanting every day to heed the desires for those joys rather than the earth shattering fears I have always attended until now. So I wish this for you and I as we wend our way to the end of the alphabet: that we may have a powerful love inside each of us enabling all of the necessary journeys that we need - or even want - to make.